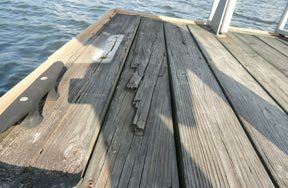 I love being by the water, any water. Kayaking on Deep Creek Lake, watching the boats by the marina at Saltholmen, listening to waves crash on a beach, crabbing on Urbanna Creek, fishing with my aunt on her pontoon boat, canoeing on the pond at camp, I love it all. We dream about having a place that overlooks the water, pulling a tube behind our ski boat, watching sunsets out on the dock. Part of me wanted to rip it out down to the studs, but I'm too practical. Most of it was in good shape so I just tweaked the surfaces. Here is how it looks now. It's hard to pick my favorite part, but I think the flooring made a big difference. Since the existing tile was in good shape I was able to lay peel & stick vinyl planks over the top. Score it with a knife and snap it off, or use shears to cut rounded edges - pretty easy. Another big difference was neutralizing the navy and teal accent tiles with Rust-oleum Tub & Tile epoxy paint. I sanded down the shiny tile glaze to give it some tooth, then taped it off and rolled on the paint in one big stripe (right over the grout) with a narrow foam roller. Those are now a bit whiter than the other white tiles on the wall, but they no longer scream for attention. 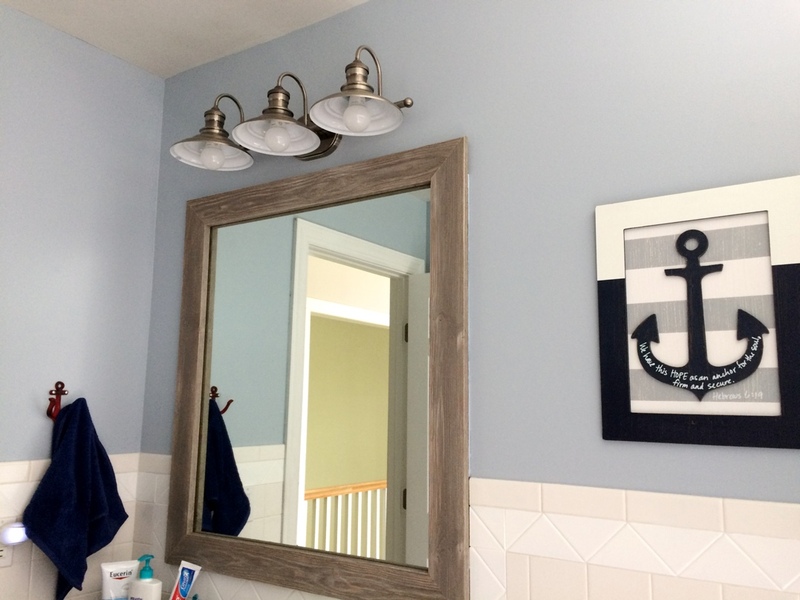 I also rolled this paint on the edges of the vanity cabinet doors and drawers, covering the yellowed melamine edging. 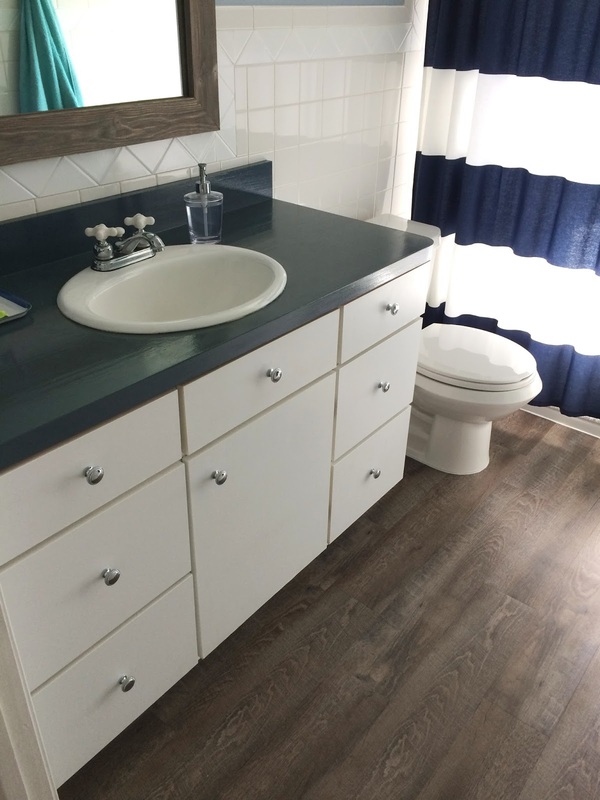 (Originally I was planning to add 2" trim strips to each door/drawer for Shaker style, but the cabinet already projects as far forward as the vanity top so I didn't want to give it an underbite). 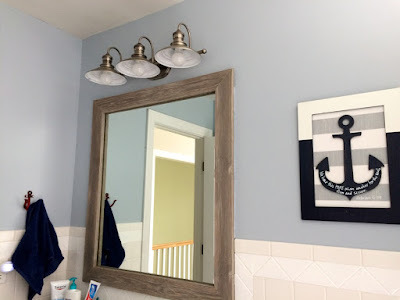 Weathered wood is popular right now, so in addition to having great flooring options I also found pre-stained rustic lumber to frame out the mirror. 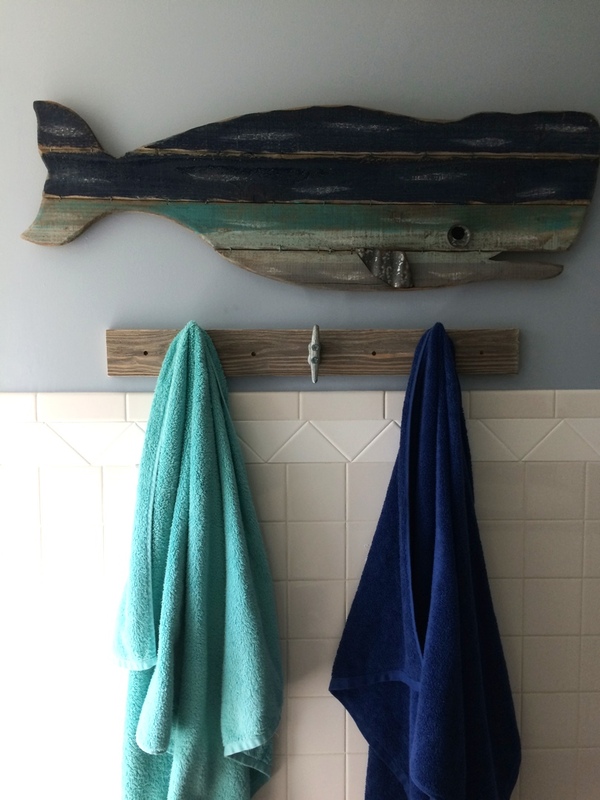 A scrap piece became the towel rack along with galvanized dock cleats. The kids actually hang up their towels now. Well done, looks fantastic! 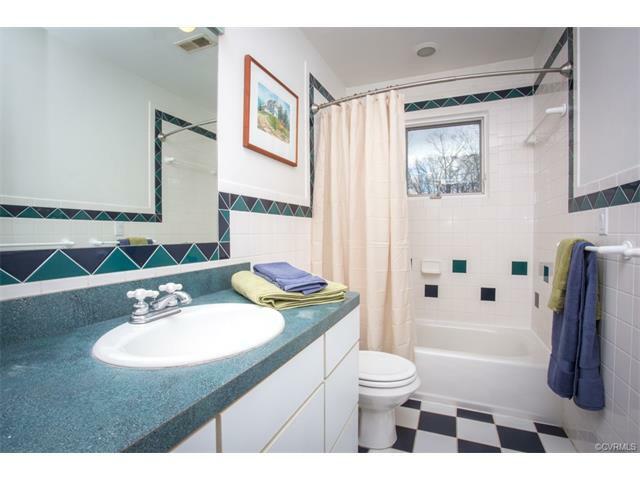 We just bought a house and all the bathrooms need updating/renovations. We got an estimate for the master bathroom, $40K. 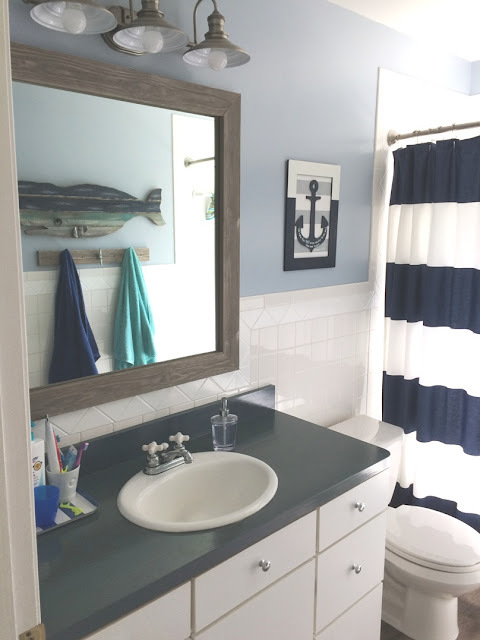 Forty thousand dollars to renovate a bathroom! Even if I had $40K I wouldn't spend it on a bathroom. Your post has inspired me to consider some DYI. HAHAHAHAA! 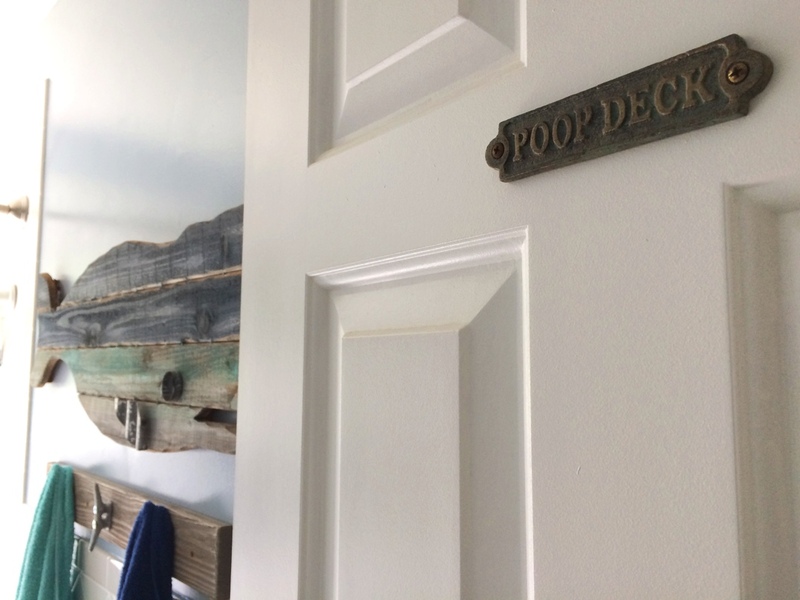 I love the "Poop Deck" sign! You're too funny Anne! Such a beautiful makeover.